The other morning we made homemade peanut butter. This is one of the easiest things you can make. Peanut butter is pretty expensive here. But at a local discount store, we can get an entire kg. of peanuts for 30 sek. All you need is some (roasted and salted) peanuts (we make 250 g. batches), a bowl and a blender. I prefer a hand blender. 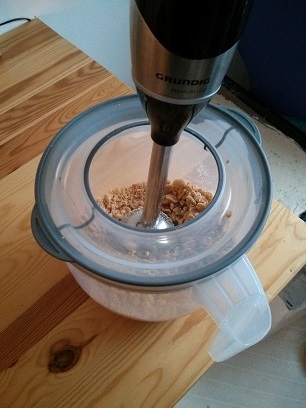 Blend the peanuts till they turn into a smooth buttery substance, and there you have it. Homemade peanut butter! Easy as pie, right? We keep ours in a sealed container in the fridge. I don’t know exactly how long this will stay good, as we usually go through ours pretty quickly. I think the longest we’ve kept a batch is about a week and it was still fine. Make smaller portions if you are not sure how fast you will eat it. Just a little heads up, do NOT wash the peanuts before you blend them! They will not stick together when blending, if you wash them. If you already washed them, don’t worry. The peanuts are not completely wasted. Let the peanuts dry off and then freeze them. Add them to cookies and cakes later.